​We adopted a very shy and under socialized young dog from a local rescue. With training and a group socialization led by Chelsea at Canine Connection, we were able to transform Emma into a confident and friendly little girl. We will always be grateful for the help she provided (and continues to provide) for us. ​So far so good! We really enjoy the personalized in-home training Chelsea offers! Our kids are learning so much, and Chelsea has been a wonderful asset! ​Chelsea worked with my 7 year old Pomeranian who would always bark obnoxiously whenever anyone came to the door or knocked. Now I don't have to worry about my newborn baby waking up when visitors come! Thanks Canine Connection! 5 out of 5 stars on Thumbtack! ​Stella Mae is not an easy fix, but she took to Chelsea very quickly (a major feat!). I saw much improvement in the 6 weeks we worked together, and I now feel like I have the tools to continue the work she started. Thanks Chelsea! 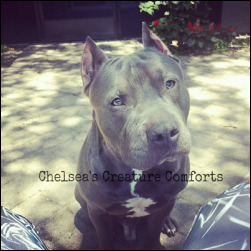 ​Chelsea is the most dedicated, talented, gifted, patient, and loving animal trainer. I am so very blessed to have found her when I needed someone to train my new puppy to become a service dog. Through Chelsea's positive reinforcement methods and her years of expertise, my shiba inu Chiyo has become the most wonderful fully task trained service animal. She even trained him to do my laundry and empty the dishwasher! Working with Chelsea has been a completely life saving experience for my disability, and together we have created an incredible service dog in Chiyo. I highly recommend her to anyone looking for a trainer, for any and every level! ​Chelsea is awesome, I can't imagine anyone better to leave my doggie with. When she picked him up this morning he had no trouble getting in her car and anytime I mention her name his tail goes wild. Not only does Chelsea treat pets with upmost love, care, and respect, but she also is very courteous leaving lights on when she knows I will be home late and bringing in my packages. LOVE HER and the services she offers. I cannot tell you how many times Chelsea has saved me in a last minute situation. I have called Chelsea with literally minutes notice and she has been able to help us. Not only has Chelsea provided the education and guidance that allowed us to keep our rescued large Great Dane by caring for him and training us how to deal with a poor rescued animal but she has literally saved this dogs life by working with him on dealing with "humans" especially small humans. We have left Chelsea in charge of our home and our babies for literally Weeks at a time while we travel. Chelsea is always my go to every thing! She even came over and "baby" sat so the cable guy could come inside while the dog was here! When we were out of the country and someone was house sitting she was the ONLY person who could get the cat off the roof, and when she was called, she literally came straight over to help our friend who was house sitting/living here at the time. ​5 out of 5 stars on Facebook. We used Chelsea for training our female Great Pyrenees (a very stubborn, independent and headstrong breed). Under Chelsea’s direction, Belle progressed through multiple training levels to achieve her Canine Good Citizenship certification and is working towards her certification as a therapy dog. We have been extremely pleased at the results of Chelsea’s training because she not only trains the dog, but she educates the owners as well. By providing us the education, guidelines and her most valuable experience, Chelsea’s training has equipped us with the essential tools and confidence which assists us with the continuing development of our dog as well as our newest Great Pyrenees puppy. We have also participated in organized puppy socializing events and the care and dedication Chelsea shows all dogs and their owners is remarkable. We have recommended, and will continue to recommend Chelsea for training. 5 out of 5 stars on Facebook. Chelsea is an extremely dedicated animal caretaker. She helped me train and care for my beloved four legged son Bandit. I am devastated that I had to move back to Massachusetts because I know I'll never find a dog sitter as dedicated as Chelsea. When my pup was 8 weeks old I hired Chelsea to dog sit while I was away at work and when i had to go on a week long business vacation. I had an in home camera system set up and though I only paid her to come over twice per day during my vacation, I constantly saw that she made a habit of coming over at least 3 times a day and never charged me for the extra visits. Sun: OFFICE CLOSED. Still offer services but all calls will returned the following day.